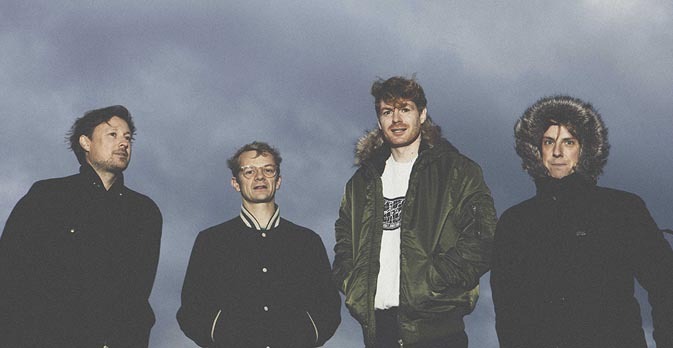 Tommy Grace, formaly Django Django's synth operator, tells us in this phone call that the band's work on songwriting and production is definitely collective, although driven by David McLean's ideas. Tommy's answers explain the phylosophy which the band's work is based on. You said that, about the methodology to make the album, you switched back to what you did with the first album. When did you realize that you wanted to make this choice? Is it because of the songs were shaping up, or was it something you wanted to do from the very beginning? We didn’t completely go back to the way we made the first record, but there were certain thing about making the first record that, looking back, were really helpful. We gave ourselves a lot of time and had control over everything, but there were also some things about making the second record, that we went to a professional studio, and we got some really good recording of drums and other stuff. So, there were just bits of how we made both record that we wanted to hold on to, so, we just want back to our own studio, which is a little bit like Dave’s old bedroom, where we made the first record, except that now we got lots more gear, and it was there where we really made the record. We felt we had lost a bit of control over the second record, because we needed an engineer to control the massive desk in order to do things, and get changes. I guess we just wanted to get rid of a middle man for this record, I think it’s quite important to us. We think that this new album is more electro-driven than the previous ones. Do you agree? If so, how did you come to this? It wasn’t a so much conscious decision, we recorded a lot, we could have released two albums of songs, and when we had to decide which song to include on the album, we realized that the more electronic ones were better together. We got lots of acoustic songs that didn’t make this record, and I think we’ll put them out on another record, maybe at the end of this year, maybe it won’t be a full album but just an Ep. In our studio now we have lots of synths and drum machines, past and present, so we wanted to use them of course. We also made some samples, and played with other drummers. I can assure you that also those acoustic tracks are nice. Would you like to tell me something about your songwriting process? With this record, me, Dave and Jim worked much more together than in the past. We created demos, then we went to the studio and Dave, who is the main producer, worked on them, he does a lot of cutting up, so maybe me and Jim might have written a song, but Dave would change the sequence between verse, medley and chorus, or put the medley in the intro, or he changes some chords, I think he’s really skilled in order to make a song flow, his work is really essential. I think there are a lot of layers in the sound, and I like it, and I also think that the rhythm is not just a beat, but it’s included in the sound texture, and it’s another thing I like. Yes, we have a lot of layers, we use an old program called Cubase, and one of its beauties is that you can use it in unlimited ways, you can really handle a lot, while most programs just can’t handle all the layers we had, even if you go to a professional studio. We just work a lot on all the songs, and we use the same collage approach that I described earlier about writing them. Writing process is about record what we wrote, put it into a computer, then take it out and cut and paste, and also when we work on production, we do it the same way, I think there’s no better way to create a song. We think that, on this album, there is a different interaction between rhythm and melodies than in the past, because your melodic style is usually quite unconventional, and so was the tempo, but here, the rhythm feels more straight, but the melodic style is unconventional as it was in the past. I’m not sure I can talk analytically about how the rhythm elements and the melodic elements come together, it’s not something I really thought about particularly. About the feature of Rebecca from Slow Club, was this song written thinking about a female external voice, or did you just write it as it should have been sung by you like all the other songs? I wrote the melody of that song, but I’m really, really bad at singing, so, when I write any melody, I just play it on piano, or a synth, and I wrote this when Dave was away, so there was just this melody written on a synth, then Dave came back and he sang on it, and it was fine, but we didn’t find it particularly interesting, so we put it on the back for some time. Then, a couple of months later, Dave brought Rebecca in the studio, they were recording for her solo project called Self Esteem, they were recording some songs for that project, and Dave at some point asked her if she wanted to sing for that chorus, and she didi t and it sounded really good, so she ended up singing on the whole song, and it feels nice, I like it, it’s cool. We think that there’s a sense of irony in your music, not because you’re making jokes, but we just think that irony has a role in Django Django’s style. Do you agree? No, it’s something we try to avoid really, I think there can be a sense of humour, but we don’t like irony, mainly because it might look like a shield, so it looks like you’re not showing your emotions, and that’s not what we’re interested in. Hopefully you’re touring a lot and coming back to Italy, what can we expect from your current live show? Just new lights and new songs, and, because of the weird way we make songs in the studio, we always have to learn them again to play them live, so we change them a lot, we like to create our live show and that’s a totally separate thing from recording, we always try to make songs in a specific way to play them live, and we just try to keep as much energy as possible, we started playing tiny shows in London, where you just have to keep people to tension, so we’re used to play in a more in your face style, and we kept that, so I hope it has the feel of a party too, where people can dance. If people dance, that’s a good Django Django gig. Il debutto del quartetto britannico, tanto ricco di riferimenti, quanto miracolosamente equilibrato e ..